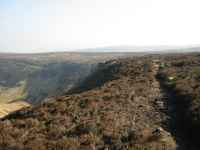 The walk from Ponden Reservoir to Ponden Clough is about 1½ miles long, at certain points there are 360 Panoramic views which are signed with direction traveling from and going to. You can rotate these left/right/ up/down. Each should take about 20-40 sec to download. 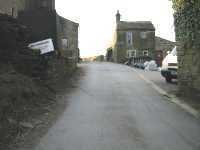 Take the road (pictured) and head west, by the sailing club it turns right and begins to climb. 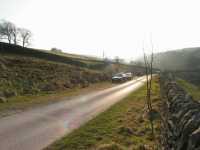 The tarmac road climbs, Ponden Hall is on your right, (pictured) behind the railings. Elevation is 859 ft. Distance traveled is 0.16 of a mile. 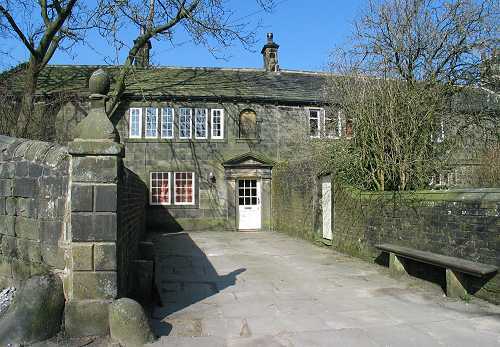 Emily Bronte portrayed the house as "Thrushcross Grange" the home of the Linton family in "Wuthering Heights". As you walk up look at the gable end of the house, the tiny single paned window is believed to be the one the ghost looked out of. 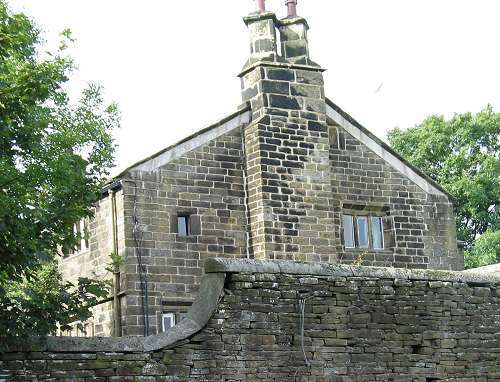 "The Old house now Standing was built by Robert Heaton for his son Michael, Anno Domini 1634. 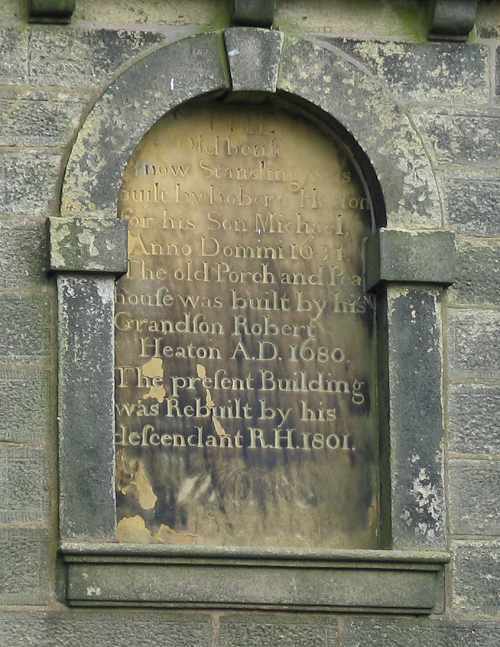 The old Porch and Peahouse was built by his Grandson Robert Heaton A.D 1680. The present building was rebuilt by his descendant R.H.1801." 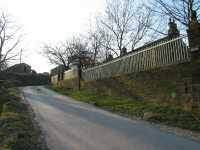 The road climbs up past a row of cottages and outbuildings. Just past these buildings the tarmac ends. Carry on up to the tree and take the path left, the surface is a mixture of loose gravel and in some sections concrete path. The panoramic view is taken just beyond the tree looking over Ponden Reservoir, Click on picture for detail. Elevation is 885ft. Distance traveled is 0.26 of a mile. 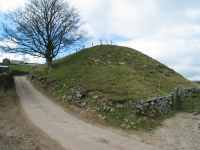 On your right there is a quarry spoilheap, continue along the road which climbs. You will come to a fork in the road, on the left is Height Laithe farm - named by a mill stone in the wall, take the path right. Elevation is 946ft. Distance traveled is 0.41 of a mile. 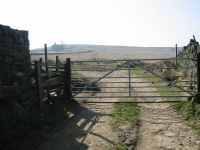 At the end of the track there is a gate, on the left a stile, cross over this and follow the track straight ahead. Elevation is 1015ft. Distance traveled is 0.48 of a mile. 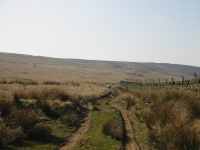 Follow the track, carry on past the wall to your right until you get to a sign, take a left climb on to the moor. 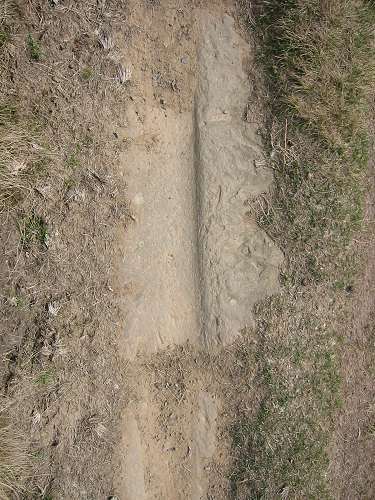 On some of the stone slabs you can see grooves made by carts. Take a 360 Panoramic view here... Elevation is 1050ft. Distance traveled is 0.61 of a mile. 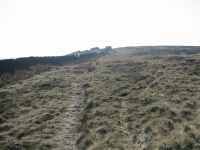 Climb the moor along the narrow defined path of grass and heather, which is marked at intervals by posts. 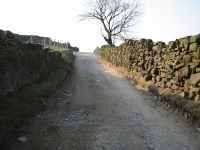 A dry stone wall is on your left with an old farm house on the other side. 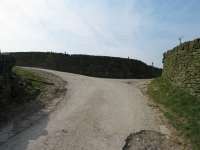 At the end of the wall which takes a left curve there is a signpost, carry on up the hill. At the top of the hill to your left you get a view of Ponden Reservoir. Elevation is 1220ft. Distance traveled is 0.87 of a mile. Click on picture for detail. The path is loose shale in parts, you can see Ponden Clough and Ponden Kirk in the distance ahead of you. 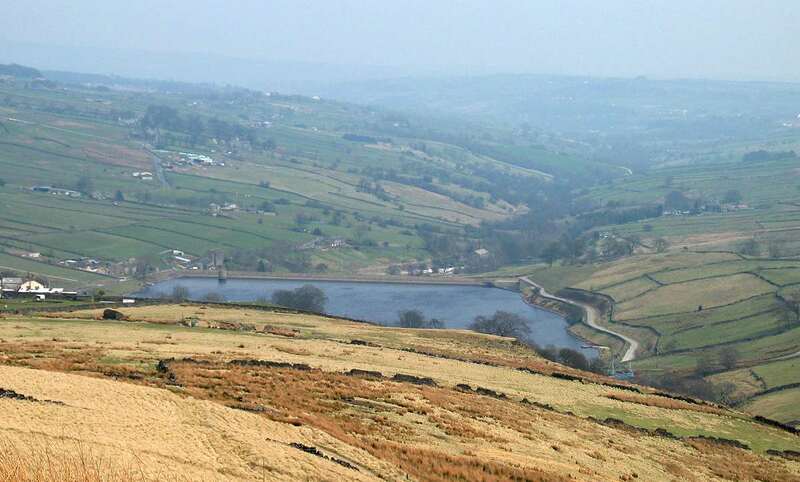 Looking east you can see Ponden Reservoir, Stanbury and Haworth. These are marked on the 360 panorama. 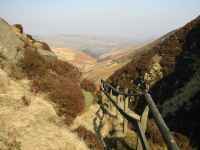 The path winds round the valley, Ponden Clough and the Kirk stone are visible on the other side. The walk takes you to a stream and a small waterfall. 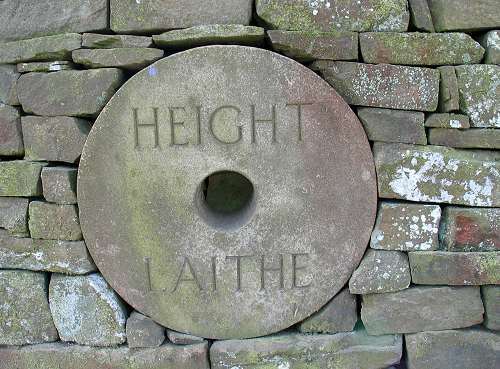 This area has many stones about with names carved. Elevation is 1292ft. Distance traveled is 1.14 mile. Panorama is view looking across to Ponden Reservoir (100kb). 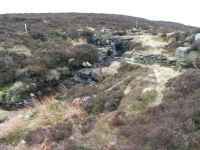 To the right of picture you can just make out the Turbine at Haworth quarry. Click on picture for detail. 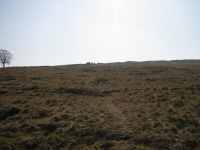 After visiting Ponden Kirk, head back on to the path and carry on, there is a sheepfold on you right. Further on it can get boggy in parts. 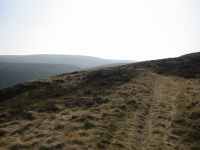 Not far ahead is Ponden Clough. Looking Right you can make out the Alcomden Stones in the distance (360 Panoramic view of the Alcomden stones here...). Elevation is 1226ft. Distance traveled is 1.44 mile. To your left there are basic steps and a hand rail to help you climb down. Ahead is a view of Ponden reservoir as you descend the steps. 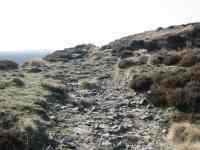 Bottom of the Clough, distance traveled is 1.50 mile.